Why should the aid/relief/development community care about global environmental change (Pt. 2)? Yesterday, I took the relief community to task for not spending more time seriously thinking about global environmental change. To be clear, this is not because that community pays no attention, or is unaware of the trend toward increasing climate variability and extreme weather events in many parts of the world that seems to be driving ever-greater needs for intervention. That part of the deal is pretty well covered by the humanitarian world, though some folks are a bit late to the party (and it would be good to see a bit more open, informal discussion of this – most of what I have seen is in very formal reports and presentations). I am more concerned that the humanitarian community gives little or no thought to the environmental implications of its interventions – in the immediate rush to save lives, we are implementing projects and conducting activities that have a long-term impact on the environment at scales ranging from the community to the globe. We are not, however, measuring these impacts in really meaningful ways, and therefore run the risk of creating future problems through our current interventions. This is not a desirable outcome for anyone. But what of the development community, those of us thinking not in terms of immediate, acute needs as much as we are concerned with durable transformations in quality of life that will only be achieved on a generational timescale? You’d think that this community (of which I count myself a part) would be able to grasp the impact of climate change on people’s long-term well-being, as both global environmental changes (such as climate change and ecosystem collapse) and development gains unfold over multidecadal timescales. Yet the integration of global environmental change into development programs and research remains preliminary and tentative – and there is great resistance to such integration from many people in this community. Sometimes people genuinely don’t get it – they either don’t think that things like climate change are real problems, or fail to grasp how it impacts their programs. These are the folks who would lose at the “six degrees of Kevin Bacon” game – I’ve said it before, and I will say it again: global environmental change is development’s Kevin Bacon: I can link environmental change to any development challenge in three steps or less. Sometimes the impacts are really indirect, which can make this hard to see. For example, take education: in some places, climate change will alter growing seasons such that farm productivity will be reduced, forcing families to use more labor to get adequate food and income, which might lead parents to pull their kids from school to get that labor. Yep, at least some education programs are impacted by climate change, an aspect of global environmental change. Other times, though, I think that the resistance comes from a very legitimate place: many working in this field are totally overtaxed as it is. They know that various aspects of global environmental change are problems in the contexts in which they work, but lack the human and financial resources to accomplish most of their existing tasks. Suddenly they hear that they will have to take something like climate change into account as they do their work, which means new responsibilities that will entail new training, but often come without new personnel or money. It is therefore understandable when these folks, faced with these circumstances, greet the demand for the integration of global environmental change considerations into their programs with massive resistance. I think the first problem contributes to the second – it is difficult to prioritize people and funding for a challenge that is poorly understood in the development community, and whose impacts on the project or initiative at hand might be difficult to see. But we must do this – various forms of global environmental change are altering the future world at which we are aiming with our development programs and projects. While an intervention appropriate to a community’s current needs may result in improvements to human well-being in the short term, the changes brought on by that intervention may be maladaptive in ten or twenty years and end up costing the community much more than it gained initially. Global environmental change requires us to think about development like a fade route in football (American), or the through ball in soccer (the other football). In both cases, the key is to put the ball where the target (the receiver of the pass) is going to be, not where they are now. Those who can do this have great success. Those that cannot have short careers. Development needs to start working on its timing routes, and thinking about where our target communities are going to be ten and twenty years from now as we design our programs and projects. So, how do we start putting our projects through on goal? One place to start would be by addressing two big barriers: the persistence of treating global environmental change as a development sector like any other, and the failure of economics to properly cost the impacts of these changes. First, global environmental change is not a sector. It is not something you can cover in a section of your project plan or report, as it impacts virtually all development sectors. Climate change alters the range and number of vectors for diseases like malaria. Overfishing to meet the demands of consumers in the Global North can crush the food security of poor coastal populations in the Global South. Deforestation can intensify climate change, lead to soil degradation that compromises food security, and even distort economic policy (you can log tropical hardwoods really quickly and temporarily boost GNP in a sort of “timber bubble”, but eventually you run out of trees and those 200-500 year regrowth times means that the bubble will pop and a GNP downturn is the inevitable outcome of such a policy). If global environmental change is development’s Kevin Bacon, it is pretty much omnipresent in our programs and projects – we need to be accounting for it now. That, in turn, requires us to start thinking much longer term – we cannot design projects with three to five year horizons – that is really the relief-to-recovery horizon (see part 1 for my discussion of global environmental change in that context). Global environmental change means thinking about our goals on a much longer timescale, and at a much more general (and perhaps ambitious) scale. The uncertainty bars on the outcomes of our work get really, really huge on these timescales . . . which to me is another argument for treating development as a catalyst aimed at triggering changes in society by facilitating the efforts of those with innovative, locally-appropriate ideas, as opposed to imposing and managing change in an effort to achieve a narrow set of measurable goals at all costs. My book lays out the institutional challenges to such a transformation, such as rethinking participation in development, which we will have to address if this is ever to work. Second, development economics needs to catch up to everyone else on the environment. There are environmental economists, but not that many – and there are virtually no development economists that are trained in environmental economics. As a result, most economic efforts to address environmental change in the context of development are based on very limited understandings of the environmental issues at hand – and this, in turn, creates a situation where much work in development economics either ignores or, in its problematic framings of the issue, misrepresents the importance of this challenge to the development project writ large. Until development economists are rewarded for really working on the environment, in all its messiness and uncertainty (and that may be a long way off, given how marginal environmental economists are to the discipline), I seriously doubt we are going to see enough good economic work linking development and the environment to serve as a foundation for a new kind of thinking about development that results in durable, meaningful outcomes for the global poor. In the meantime, it seems to me that there is a huge space for geographers, anthropologists, sociologists, political scientists, new cultural historians, and others to step up and engage this issue in rich, meaningful ways that both drive how we do work now and slowly force new conversations on both economics and the practice of development. I do admit, though, that my expanding circle of economics colleagues (many of which I connected to via this blog and twitter) have given me entrée into a community of talented people that give me hope – they are interested and remarkably capable, and I hope they continue to engage me and my projects as they go forward . . . I think there is a mutual benefit there. Let me be clear: the continuing disconnect between development studies and environmental studies is closing, and there are many, many opportunities to continue building connections between these worlds. This blog is but one tiny effort in a sea of efforts, which gives me hope – with lots of people at work on this issue, someone is bound to succeed. In part three, I will take up why global environmental change means that we have to rethink the RCT4D work currently undertaken in development – specifically, why we need much, much better efforts at explanation if this body of work is to give us meaningful, long-term results. Back in April, I participated in a session on the role of geographers (and indeed academics more broadly) in development agencies. Though many outside of academia do not seem to know this, engagement with development agencies by those of us working in geography, anthropology and sociology tends to provoke both strong feelings and some controversy. Given geography’s and anthropology’s historical connection to colonialism, many academics fear that engagement with these agencies risks a return to these old relationships, where the work of academics serves to legitimize or even further neocolonial efforts. I thought the session was outstanding – the discussion was probably the most spirited I’d seen at an AAG, but it never degenerated into name-calling or other unproductive behavior. Due to the success of and interest in the session, the participants in my panel decided to put together a forum of brief position pieces to be published in the Transactions of the Institute of British Geographers, hopefully later this year (screaming fast by academic standards). In my short piece, I took up the argument that we should be engaging with agencies more (probably not that surprising, considering where I work these days) – a position I supported in a distressingly well-read email exchange on a few big listservs this past fall (see a related blog post here). Before I submitted it, I had to get it cleared by Legislative and Public Affairs (LPA), which led to several people reading it. It was cleared without comment, which I believe only serves to support Bill Easterly’s claim (made in the context of the World Bank) that nobody really cares what we write in the academic journals, because they don’t think anyone reads them. Along the way, though, my office director read it. Or, more to the point, he read it three times, because, as he put it, it was “impenetrable.” He did not say this dismissively, but instead to point out that the jargon in which I engaged in the piece (and I fully admit that my piece is very, very jargon-laden) made it nearly impossible to follow for the non-academic. To his credit, he read it three times to get my point . . . how many people do you know who are willing to do that? So, in the spirit of his intervention, I offer a translation of my piece, in two parts. This is part 1. Engagement with international development is fraught with tension. On one side lies a belief in improvement that carries with it judgment of the lives of others. At its worst, this judgment can become a justification for the lifestyles and foreign policy of “the developed” by placing both at the top of a pyramid of human progress to which everyone should aspire. On the other side is the peril of an extractive intellectual industry. When academic research and writing on development has no impact on policy and practice, it serves only to further the career of the researcher who gains from those s/he researches. It is not possible for an academic to engage development and remain unsullied by one, the other, or both. I see the job of the academic in development as walking between these extremes, balancing the risks of each. Therefore it is incumbent upon each of us to evaluate critically the path we walk between them. It is very difficult for the contemporary academic to make such a critical evaluation. Critical development studies are often based upon a surprisingly thin understanding of the object of research. I can count on the fingers of one hand the development geographers who have worked in a development agency (receiving a contract from a development agency as a consultant or subcontractor does not count, as in that case one is only seeing the end product of a long process of policy building, budgeting, programming and contracting). Yet without an understanding of mundane bureaucratic moments such as budgeting, contracting and monitoring and evaluation it is simply impossible to understand why agencies do what they do, or reliably to identify points of intervention that might change practice in the world. Though it was a book that brought me to critical development studies, Ferguson’s The Anti-Politics Machine is exemplary of this problem. Ferguson’s analysis of the Canadian International Development Agency’s (CIDA) Thaba-Tseka project is constrained largely to the reports and field programmes that are the outputs of this complex process. There is no doubt that he is correct about the ways in which CIDA’s representation of Lesotho and its challenges bore little resemblance to events on the ground. However, without a link to the institutional practices and structures that are inextricably bound up with these (mis)representations, Ferguson’s explanation for development failure comes to rest on a vague sense that language/representations (largely reflected in documents related to development projects and agencies) shape action. But this language, and these representations, are produced and reproduced in the often-byzantine interplay of policy, budget, programme and contracting that currently happens outside the scope of analysis for the bulk of academics. Pointing out the problematic character of CIDA’s representations of Lesotho is not in itself a productive intervention – we must know when this construction was put into play, by whom, and to what end. This information cannot be inferred from an organizational chart or a history of organizational actions. Instead, it requires ethnographic attention in its own right. A very large proportion of critical development studies rests on this sort of incomplete analysis, resulting in critiques and questions that often have limited relevance to the experience of development practice. The mismatch of the products of such analysis with the experiences of those who occupy positions in development institutions is a source of the widening gulf between academic studies of development and the work of the development agencies we criticize and seek to influence. This suggests that productive critical interventions require greater direct engagement with development agencies. Next up, Part 2: Why does this failure of understanding prevent serious engagement? Why the world needs geographers . . . 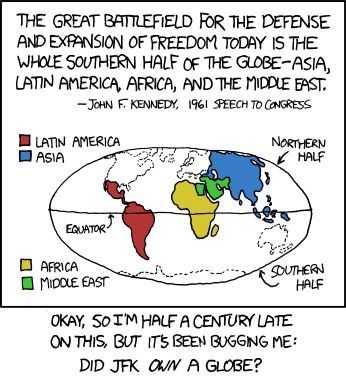 Thank you, xkcd. Thank you. Open The Echo Chamber is powered by	WordPress 5.0.4 and delivered to you in 0.546 seconds using 103 queries.